CD review: "The Golden Voice of Robert Covington"
This review first appeared in the May/June 1989 issue of Living Blues magazine. Like Casey Jones, Robert Covington is a drummer who after years of gigging around Chicago is finally getting a chance to show off his considerable vocal and compositional skills. 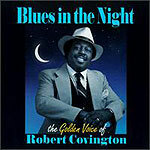 On "The Golden Voice of," Covington combines an oh-so-smooth voice with original material featuring big, fat melodies. Covington's songs range from the velvety R&B-influenced "Trust In Me," to the rambunctious "I Don't Care." Covers of the standard "Blues in the Night" and Willie Dixon's "I Just Want to Make Love to You" show a nice touch at interpretation. He can handle both soft and uptempo songs with aplomb, ranging from a light-as-a-feather satin on "Better Watch Your Step" to a growling tenor on "Mean Mistreater." On the slower tunes, his vocals are just a hair behind the beat, giving his songs an even more relaxed feel. Throughout, Covington's drumming is loose and relaxed. The backing musicians are as strong and tight as Covington's music. Carl Weathersby is low-key on guitar, alternating smoothly between a hammering rhythm and fluid leads. Pianist Sumito Ariyoshi, only five years removed from his native Japan, plays with a boogie twist that sounds like he grew up in the French Quarter. On "Mean Mistreater," his intro is so spirited and syncopated it dredges up memories of Professor Longhair. (And check out his Jimmy Smith-like organ on "I Want to Know.") And guest harpist Scott Bradbury lays down a hell of a harp track on "I Just Want to Make Love to You," chasing Covington all over the venerable tune. Guest guitarist Peter Crawford shines bright during his cameo on "Better Watch Your Step." Simple, time-honored phrases are laid out with great feeling through a half-dozen layers of distortion that give the tune a slightly tarnished feel. The horn section is composed of tenor saxophonist John Brumbach, trombonist Billy McFarland, trumpeter Steve Jensen, and altoist Paul Haney. They lay down Memphis-styled charts on several of the tunes, the most prominent being "Playing On You." The best horn solo is Brumbach's smokey, sinuous intro on tenor for "Blues in the Night." Covington's vocals match the mood Brumbach sets down; his slow-burning delivery growls or, alternately, sustains a sweet note at just the right point on this torch song. And, after Covington has his say, Brumbach comes back with an evocative response.